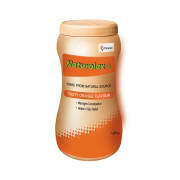 Naturolax - A is a powdered form of natural Isapgol husk which is an effective remedy for constipation. It is a natural fibre supplement which is also helpful in reducing cholesterol. It is also useful in conditions such as liver enlargement, anemia, hyperacidity and hepatitis. It is also useful in removing harmful toxins from the body. Add one heaped teaspoon (approx 5.6 gms) of Naturolax-A in an empty glass. Fill the glass with water and stir the mixture such that the contents should get mixed with water. Dosage should be directed by the physician. A licensed pharmacy from your nearest location will deliver Naturolax -A Powder Orange. Once the pharmacy accepts your order, the details of the pharmacy will be shared with you. Acceptance of your order is based on the validity of your prescription and the availability of this medicine.